So how did it get left behind in the asset management boom? Brian Bannon is the Owner of ThermaXX, LLC (www. thermaxxjackets.com). He has a proven track record of success as a founder, active investor, and owner of several companies in manufacturing, construction, energy, and the robotics industries. He has 25 years of experience in building companies. Mr. Bannon enjoys uncovering industry problems and solving them with the introduction of new technology. His most recent construction industry venture is a removable insulation manufacturer called ThermaXX Jackets. He can be reached at bbannon@thermaxx.es. Contributor: Andrew Martin, President, I-Star Energy Solutions (www.istarenergysolutions.com), is a contractor specializing in energy savings, pipe insulation, and building envelope. He can be reached at andymartin@irexcorp.com. The mechanical pipe and valve insulation industry is one of those that is slow to adopt new technology. This is not because the industry is made up of Luddites, but because older industries tend to wait until a technology has been fully proven and the “need” is knocking at the front door. Throughout my years in the construction industry, I often marveled at the workmanship when walking through a new boiler or chiller plant. The tight seams, the mitered pieces, the detail in sealing the ends, the tight aluminum or stainless jacketing—insulation truly is as much of an art as it is a science. Technology has always been a little slow in penetrating markets that require skilled manual labor. I witnessed this firsthand in a similar industry—water and wastewater—back in 2004. I was an investor and Vice President at a robotics company that was spun out of The Carnegie Mellon Robotics Institute. I worked closely with the talented mechanical and software engineers on a daily basis as we released new cutting-edge products into the water and wastewater inspection markets. The technology was groundbreaking. The old technique of analog video inspection was quickly converted to submerged sonar and 3D laser scanning. The industry has not looked the same since the first wastewater pipe was inspected with an autonomous, multisensor, smart robot in 2006. As we developed new product after new product, I would always attempt to think of a solution for the insulation industry. The issue was always repetitiveness. Robots are very good at doing the same task over and over. This, however, is the opposite of the insulation industry. I consider 100 linear feet of 2” pipe to be like a fingerprint—there are no 2 that are identical in the world. That ruled out a mechanical solution. A software solution was a different story. The term, the Internet of Things (IoT) was coined in 1999 by Kevin Ashton of Procter & Gamble (later MIT’s Auto-ID Center), in 1999. It refers to the internetworking of physical devices embedded with electronics, software, sensors, and other network connectivity devices that allow these objects to collect and exchange data. Why aren’t pieces of pipe insulation—or removable jackets—on the Internet? Why doesn’t a business owner have real-time visibility into the progress of a project from his or her desktop or laptop computer? Why did the asset management boom forget about insulation? Why are we still using paper and convincing ourselves that Excel and PDF scanning are cutting edge? >2,000 removable jackets covering high-, medium-, and low-pressure steam and heating hot water flange valves, steam traps, pumps, flange pairs, and valve bonnets. Over 60 buildings, in 7 cities, located in 3 different states. Pipe Insulation Assets Need to Be Tracked Too! We began looking at ways to create an asset-tracking system for pipe insulation that would be easy to use and would not require additional hardware. It would allow an insulation contractor to quickly and efficiently document the install and insulation quality. The goal here was to develop a product that would sync seamlessly from the initial insulation heat loss inspection, to the project estimating, to the award, to the shipping, to the install, and finally to the operations and management (O&M) task of making sure the insulation remained intact and on the pipe for years to come. Although pipe insulation is unique in each building, the installation process is often quite similar: a mechanic installed insulation during building construction, and the building representatives and engineers inspected the insulation prior to release of payment to the installer. After several years, the system may have sustained damage—it’s common for valve insulation or parts of the straight pipe insulation to be removed or damaged during maintenance. The boiler room may get a little bit warmer every year and the gas bills slowly go up. The goal of creating an asset-tracking system would be to prevent these circumstances by mounting a scannable QR code sticker on the insulation that could be scanned after install and during routine inspection, bringing attention to potential issues. 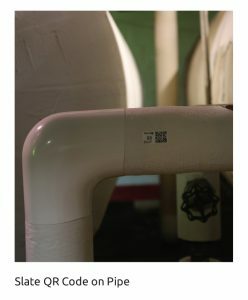 Although pipe insulation is not normally uniquely identified, most removable insulation jackets include a stamped stainless steel tag. The tag lists the insulated component type (gate valve, wye strainer, etc.). The tag may also contain pre-determined item numbers and location information. The amount of information is usually dictated by the size of the tag and the size of the font. The embryo of an idea formed. Our team looked at developing a “smart tag” that would be a unique identifier for pipe insulation. The tag had to be industrial strength quality and be able to be scanned with an iOS app to enter and captured data. This tag is called a Slate and is powered by Slate Pages™. The total scanning and data collection process takes less than 5 minutes. By way of example: If in a single location there was 30’ of 2×2” pipe on 220 degree steam, 100’ of 2×2” pipe on 220 degree steam, and 75’ of 2×1” pipe on 180 degree hot water, you would have 3 Insulation Assets to be tagged. Asset ID is a unique numerical identifier to that asset name. It is like a serial number. 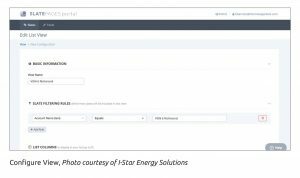 Having this information allows us to quickly identify the quantity, installer, location, and date of install. We looked at numbering each job starting with 1, but found it just as easy to keep running numbers for all jobs. This is the building or complex name. This is the room number or room name. This is the location within a room. This is the date the pipe insulation was installed. This is the amount of Btu loss per hour, per square foot, that a component is losing with no insulation. This is the amount of Btu loss per hour, per square foot, that a component is losing with the insulation. Insulation efficiency will still allow for minor heat loss. The Slate App uses the location features built in the smartphone. When the Slate is scanned, the installer captures location to document the longitude and latitude position of the pipe insulation. This information can be displayed on the Slate portal in a map view and allows the user to access and edit the data by clicking on the map pin. Once the installation is complete, the installer snaps a photo of the asset. This photo field is invaluable. It is used by project managers to verify quality and by building owners to track progress. The photos are also used by O&M inspection crews to verify the condition of the install since last inspection. Photos have been used on mechanical insulation projects since the digital camera was introduced—the issue is finding them when you need them. 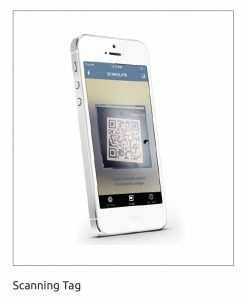 Slates eliminate that problem and link directly to the QR Code. After the insulation project is complete and the insulation assets have been scanned and uploaded, the information resides in 3 places: the Slate (QR Code), the installer’s phone, and the Web portal. Each time the system is inspected or maintained, it can be tracked. The maintenance workers have the ability to scan the pipe insulation and view any of the data. In the past, mechanical insulation paperwork resided on the engineer’s computer. General maintenance workers had no idea what the insulation thickness was or the anticipated touch temperatures. 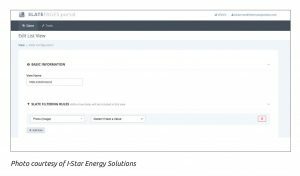 With the tag, they can now scan the Slate and view the actual insulation savings as it relates to pre- and post-Btu savings. In our modern world, people expect to have having easy access to data—now that can extend to insulation. Energy savings is a bit of a mind game. Many workers often make sure to turn off a light or close a window when leaving a room or area. Subconsciously, they know that leaving the light on is wasting energy. Insulation is a different story. When walking by an insulated pipe, it may be more typical to make note of the temperature, rather than the energy being lost. How many of us have walked by an uninsulated pipe and thought, “wow, that is hot.” Our brains are not yet programmed to think energy savings—we tend to focus on temperature or work area comfort or safety. 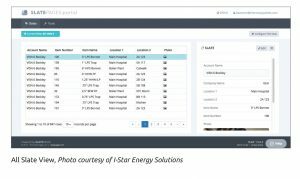 This tracking system makes that information readily available to maintenance staff, helping them understand the amount of energy that is truly being wasted by uninsulated pipes, and retraining their concept of energy waste. Next, the process of finding time and funding to fix any issues begins. That same worker will soon realize that there is more savings in one year if he or she insulated 100 linear feet of 2” bare medium-pressure steam piping than turning off all of the lights in the mechanical room for 10 years. When it comes to saving energy and money, mechanical insulation is a clear leader among energy-efficiency measures. The app stores saved scans, which can be listed by Scanned or Viewed. Many of our installers frequently use the history function to call up an asset when they are off-site or if they are on a new project and have a similar situation and would like to compare to a historical proven solution. The Web Portal truly is the secret sauce. While workers are installing pipe insulation and removable jackets, the project engineers, building owners, and construction managers are able to watch and view the project install from their desktop. The portal begins with the login. Every user creates a unique user name and password, and then every account is given an encrypted authorization code. This code is what the Insulation Assets are linked to. We link our assets by project instead of account. We could have a number of projects for a single account, but prefer to view them separately on a project-by-project view. Once signed into the portal, you can view your insulation Slates in a Slate view. If the Slates are the building blocks to insulation asset management, the Web Portal is the foundation. The main screen shows the All Slate View List. This lists all Slates associated with the account. You can add or remove columns when configuring the view. If the field exists on a Slate, you can add the column to your view. The column will sort, similar to Excel, when clicked on. Clients can also configure the portal to create specific views. Rules can be configured to only show specific assets. For example, you can display all of the insulation assets in a particular building, or all of the insulation assets of a particular kind (e.g., gate valves, 2” piping, steam traps, etc.). View configuring is a great tool for project management. If a post-install photo is required for the project, the view can have the following rule added: Show me Slates where the Photo Field has a value. This will only display the Slates that have a photo. If a project manager is looking for a to do list, they can reverse the rule: Show me Slates where the Photo Field has NO value. This will then produce a list of insulation assets that do not have a photo. He or she can then send the list to the installer to complete. When the preferred view is created, the manager can use the list to sort, export, or pick an individual insulation asset and display the details. When a Slate is used, the end user has an option to add a Location Field. 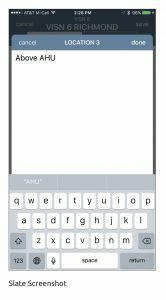 The Location Field simply uses the GPS location service on a smartphone. When this feature is used, the map view displays the assets onto a map view. The insulation assets are clustered in groups and allow zoom features on the map to narrow down to a specific building or mechanical room. Once in the room, you can click on a specific asset and expand the detail. The default color for a pin is red. Similar to the list view, maps can be configured to create rules and change pin colors. The mechanical insulation industry is about to join the asset management boom! 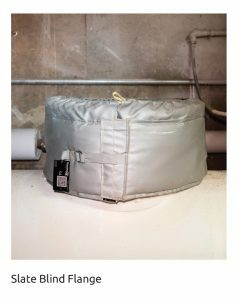 Building owners can now have pipe insulation and removable jackets installed with a unique identifier. This identifier can then be used to link construction/install documents to the insulation. 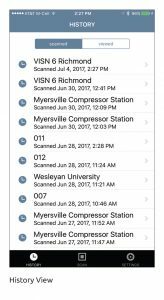 Once linked, the app can be used to facilitate yearly inspections to confirm the pipe insulation is still intact and doing its job. 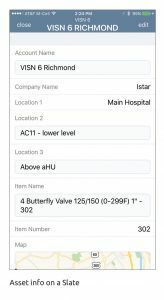 The map view will allow the building owners to manage the operation and maintenance contracts by creating views, which only display the insulation that has current photos, verifying the pipe insulation has been inspected. Overall, this technology will facilitate better maintenance and ensure systems continue to perform at a high level. 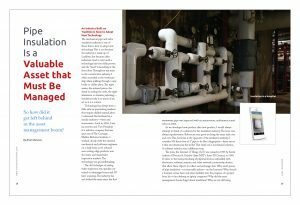 This article was published in the September 2017 issue of Insulation Outlook magazine. Copyright © 2017 National Insulation Association. All rights reserved. The contents of this website and Insulation Outlook magazine may not be reproduced in any means, in whole or in part, without the prior written permission of the publisher and NIA. Any unauthorized duplication is strictly prohibited and would violate NIA’s copyright and may violate other copyright agreements that NIA has with authors and partners. Contact publisher@insulation.org to reprint or reproduce this content.